This is one of the awesome fables stories for kids. A farmer was working in the fields on a very hot summer day. He heard a flapping sound in the distance. “What could that sound be?” he wondered. The farmer stopped his work and went to see what the sound was. It was an eagle who was caught in a trap and flapping its wings. “Oh, you poor thing. You got caught in a trap. I guess even the king of the skies can get caught in a trap. Don’t worry! I’m going to save you.” the farmer said. 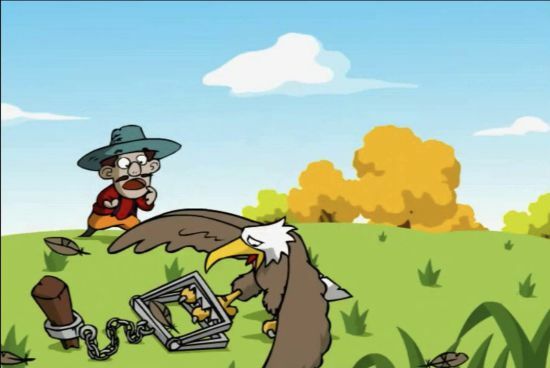 The farmer freed the eagle from the trap. The eagle spread its wings and flew away. Also, read The Eagle Who Lived Like A Chicken. Image Source @www.dailymotion.com/in. “Good-bye, eagle. Be careful next time.” the farmer warned the eagle. The eagle seemed to understand what the farmer said. It circled in the sky and flew off. “What a great bird. Oh, dear. I’d better get back to work.” The farmer smiled and headed back to the field. One day, while the farmer was resting below the eaves, an eagle came and took his hat. “What a nasty eagle. Give me back my hat right away.” shouted the angry farmer. The angry farmer chased the eagle. The eagle took the farmer’s hat and flew off. It placed the farmer’s hat under a tree in the distance. The farmer followed the eagle and stared at it. “I see the eagle took my hat on purpose to save me from disaster,” the farmer said. Now, the farmer remembered that it was the same eagle whom he helped. The farmer waved to the eagle and thanked him for saving his life. The eagle had repaid the farmer. It circled in the sky and flew off again. You may also like to read, The Tortoise And The Eagle.